Measure the circumference of your Chest at Sternum and select a size based on your measurements. VaporKrar 4L Men's Race Vest is rated 4.3 out of 5 by 18. Rated 5 out of 5 by Sean from Excellent vest. So light and comfortable This is a great running vest. I read previous reviews from folks that loved the vest but gave lower marks because of the water bottles. It took a few tries but I was able to secure the tops of the water bottles well so that they did not leak. And I loved them while running. I really like the suction system on them and how the bottles collapse as you drink water from the. The vest overall is just wonderful. It is so light that I barely noticed it on me. It has hardly any bounce and has enough pockets to store everything. The cutouts for the arms are perfect and never chafed my arms as I ran. Just a great vest. Rated 5 out of 5 by Simon from Great pack, one problem I bought the pack a month ago, along with a bladder for the back. It fits amazingly. No chafing issues, not really a need to adjust the straps once it's on. The only problem I've had, like others, is that the bottles leak. They have to be upright or they'll drip. If they're full, they drip when you run until theres not enough water in them to drip again. I like the soft flasks but the leak isn't helpful when I'm out at 4am and theres no place to refill water until I get home. If you use the 1.5L bladder, no leaks. Lots of storage. Really a great pack. Is it possible to get replacement soft flasks that dont leak? Rated 3 out of 5 by Joel from Great vest, terrible bottles! Love the vest. Very comfortable, plenty of storage. Medium fits great (6 ft, 170 lbs). My one complaint is the bottles. When I purchased the vest it came with 2 hydrapak 12 oz bottles. All they do is leak. The caps are impossible to properly thread! Major issue for aide stations or when stopping to refill. I've spent the last month trying to find suitable soft flasks... no luck. I found a UD bottle that has caps that properly thread but the straws are too short. This major oversight may be the reason switch to another vest. I'm usually very impressed with Nathan products. Rated 4 out of 5 by Erik H. from Great vest, terrible flask design I just ran a 50k wearing this vest. The vest was great! The placement of the flasks with the long straws made drinking on the go easy. There was also plenty of storage for nutrition and a long sleeve shirt. I also liked the the flasks had a wide mouth, making it easy to fill and dump in fuel. The issue i have is that the threading on these flasks are terrible making it hard to properly seal the flask. Rated 3 out of 5 by L. Lee from Unable to do the most essential task. Sadly, I wished that I had a chance to read the reviews for this vest before purchasing it for my son. 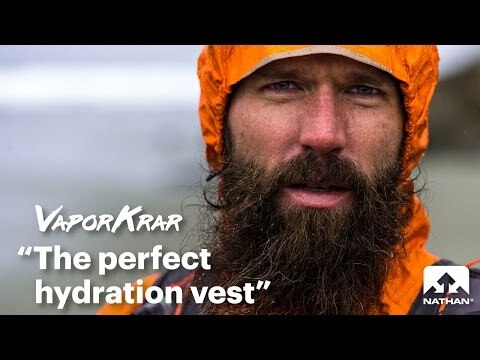 For me the first essential task of this vest is to provide hydration for the wearer. To do this one has to be able to carry fluids. As many others have noted the flasks provided with this vest are unable to do so. The flasks provided are unable to seal completely / correctly, therefore continuously leak. Reading from other various sites this is not a uncommon problem. I have noted that Nathan may have reworked the flasks so that they work properly but for someone who has spent what I consider a good amount of money purchasing this piece of equipment to do what I consider an essential thing for a runner doing long distances in harder terrains where one must be reliant on oneself, this piece of equipment fails. If the Nathan has a solution to this problem then I would be grateful to hear about it. But because of this fundamental problem I cannot recommend this product. Rated 5 out of 5 by Andy O. from Love the Vest! Took the vest out for two runs, both loaded out with water and gear, just to test the fit. I had no issues with the soft bottles â€“Â the lids seem to thread on just fine & secure. No leaks. The vest is light and has lots of convenient storage. I ordered a size up due to several reviewers encouraging that. That's my mistake. Should've gone with a Medium. Will switch out the Large for a Medium, and I should be perfect after that. Looking forward to a lot of great runs when I grab the new size. Rated 4 out of 5 by David Whitaker from Almost Perfect! Not sure if I bought a previous edition or not, but after my recent purchase, I was disappointed when I found out how difficult it was to refill the bottles.